Optional extra Twin en suite Room available by request giving sleeping for 16. Hot Tub available for hire. Billy’s Bothy is one of the most beautiful self catering cottages within the Peak District and Derbyshire. A former disused workers bothy, this outstanding quality self catering cottage is located amidst a peaceful rural setting within the grounds of our grade II listed farmhouse -just 2 miles from the historic market town of Ashbourne. There are outstanding views of the Henmoor valley and across to Bradley Woods where both cattle and sheep graze peacefully on lush pastureland . 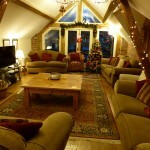 Large quality self catering cottages in the Peak District and Derbyshire area are hard to find. Billys Bothy is exceptional, it is a self catering cottage built of old handmade red bricks and Staffordshire blue roof tiles with an abundance of revealed beams and brick walls throughout. The ground floor windows are a pretty feature with elegantly curved arches over old sty openings. All windows are double glazed, these coupled with a high standard of insulation with full central heating, underfloor heating and heated towel rails means we are able to offer you very cosy and comfortable stay in a luxurious self catering cottages in the Peak District. A wood burning stove is provided in the lounge for use during colder evenings giving a warm ambience to the beautiful sitting room. 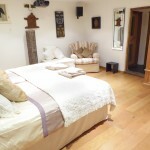 This unusual Peak District self catering cottage has 3 ground floor bedrooms, two double and one twin all with en-suite shower rooms that are tiled with elegant white wall tiles and contrasting black tiled floors. These floors have underfloor heating and heated towel rails keeping them snug all year around. On the first floor are two more double bedrooms one with en-suite shower and the other with an en suite bathroom. The bathrooms are beautifully fitted with chrome fixtures and fittings adding a touch of class and luxury.The bedrooms are furnished with hand made old pine furniture, brass and cast iron beds add character to this beautiful cottage. All rooms have co ordinated furnishings and linen which compliment the beds and lighting. The total sleeping capacity of Billys Bothy self catering cottage in the Peak District is for 10 in actual full size beds. The lounge has a double quality bed settee, with private entrance to shared en-suite bathroom. There are two single bed chairs within the bedrooms giving a total sleeping capacity of 10+ 4 + 2 travel cots. There is an option of a 6th twin or king size bedroom in the self catering cottage giving a sleeping capacity of 16 + cots if required. All bedrooms have LCD Flat screen TV’s with freeview and Wi fi. The main entrance to this self catering cottage is on the ground floor in the centre of the house with a spectacular feature galleried staircase leading up to the kitchen. The oak staircase and large oak front door and surround make a wonderful feature to the cottage entrance and can be viewed from almost all rooms within the cottage. Billys Bothy has a lovely farmhouse style kitchen furnished with hand made pine units with the luxury of quality granite worktops and a pottery Belfast sink. This extremely well equipped kitchen is a pleasure to use and has every appliance you would wish for including electric halogen double oven electric cooker, slow cooker, microwave, auto washer, dishwasher, tumble drier, cooler and fridge freezer. There are ample cooking utensils and crockery to accommodate the full compliment of guests. The kitchen is a delight for even the most discerning chef to create those culinery materpieces. For those wanting meals prepared for you then this can also be arranged enabling you to wine and dine in the comfort of these wonderful surroundings. 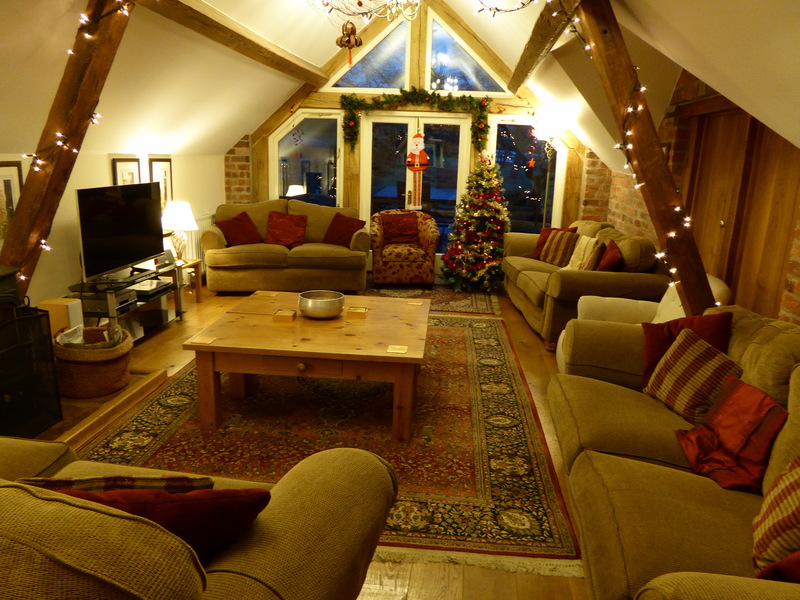 The spacious lounge with cosy log burning stove is on the 1st floor and opens out through a magnificent oak framed entrance onto a patio with cottage garden and well stocked orchard. Patio furniture , gas BBQ and fire pit are provided for your relaxation and entertainment. The lounge and patio area look over fields peacefully grazed by sheep and cattle and is totally private from the main house of Offcote Grange. The lounge has 4 comfortable quality settees giving ample seating for all guests, set on an impressive oak floor centered with a large Indian rug. A large wide flat screen TV is provided for your enjoyment with Video and DVD and Free View. A Hi Fi is provided with surround sound to follow. An ancient pine truss frames the centre of the room, with a magnificent green oak frame on the gable end of the property. The dining room is a delight for those intimate meals with friends and family, our large dining table will comfortably seat all guests. The furniture is all hand made in old pine to compliment our period cottage. A high chair is provided for our younger guests. For those of you wanting a little pampering, meals can be arranged on request. Our delightful self catering cottages edge the Peak District National Park in Derbyshire and after a day exploring and admiring the scenery, these cosy cottages are a delight to return to. Full central heating and the luxury of a log fire for those cooler or more romantic evenings is the ultimate for relaxation. All electricity, heating, logs, linen and towels are included in the price. There is ample car parking for guests, we would ask that care be taken whilst parking due to children and pets that may be in the vicinity. Children are most welcome at all of our self-catering cottages, although it is asked that guests take extra care of the children as there are animals and vehicles around the property. Within our grounds is a large nature pond – no children are allowed at this pond unaccompanied by an adult. If you have young children, you may request to have your garden area fenced off for extra safety – please don’t hesitate to ask! Please refer to the safety folder in the house for full instructions. For the heard of hearing, a hearing device is now available to assist with your enjoyment of TV and music. Please request this before arriving in order that it can be fully charged for use. For the best in Derbyshire Self Catering Cottages near the Peak District , Offcote Grange Cottage Holidays is a must. Look no further for luxury accommodation in an area of natural beauty and please do not hesitate to contact us if you require any further information.